The Etruscan language (/ɪˈtrʌskən/) was the spoken and written language of the Etruscan civilization, in Italy, in the ancient region of Etruria (modern Tuscany plus western Umbria and northern Latium) and in parts of Corsica, Emilia-Romagna, Veneto, Lombardy and Campania. Etruscan influenced Latin, but eventually was completely superseded by it. The Etruscans left around 13,000 inscriptions which have been found so far, only a small minority of which are of significant length; some bilingual inscriptions with texts also in Latin, Greek, or Phoenician; and a few dozen loanwords, such as the name Roma, but Etruscan's influence was significant. Attested from 700 BC to AD 50, the relation of Etruscan to other languages has been a source of long-running speculation and study, with its being referred to at times as an isolate, one of the Tyrsenian languages, and a number of other less well-known possibilities. Grammatically, the language is agglutinating, with nouns and verbs showing suffixed inflectional endings and ablaut in some cases. Nouns show four cases, singular and plural numbers, and masculine and feminine genders. Phonologically, Etruscan appears uncomplicated, with a four-vowel system and an apparent contrast between aspirated and unaspirated stops. The language shows phonetic change over time, with the loss and then re-establishment of word-internal vowels due to the effect of Etruscan's strong word-initial stress. Etruscan religion influenced that of the Romans, and many of the few surviving Etruscan language artifacts are of votive or religious significance. Etruscan was written in an alphabet derived from the Greek alphabet; this alphabet was the source of the Latin alphabet. The Etruscan language is also believed to be the source of certain important cultural words of Western Europe such as 'military' and 'person', which do not have obvious Indo-European roots. Etruscan literacy was widespread over the Mediterranean shores, as evidenced by about 13,000 inscriptions (dedications, epitaphs, etc. ), most fairly short, but some of considerable length. They date from about 700 BC. The Etruscans had a rich literature, as noted by Latin authors. Livy and Cicero were both aware that highly specialized Etruscan religious rites were codified in several sets of books written in Etruscan under the generic Latin title Etrusca Disciplina. The Libri Haruspicini dealt with divination from the entrails of the sacrificed animal, while the Libri Fulgurales expounded the art of divination by observing lightning. A third set, the Libri Rituales, might have provided a key to Etruscan civilization: its wider scope embraced Etruscan standards of social and political life, as well as ritual practices. According to the 4th century Latin writer Maurus Servius Honoratus, a fourth set of Etruscan books existed; dealing with animal gods, but it is unlikely that any scholar living in that era could have read Etruscan. However, only one book (as opposed to inscription), the Liber Linteus, survived, and only because the linen on which it was written was used as mummy wrappings. By AD 100, Etruscan had been replaced by Latin. Around 180, the Latin author Aulus Gellius mentions Etruscan alongside the Gaulish language in an anecdote. At the time of its extinction, only a few educated Romans with antiquarian interests, such as Marcus Terentius Varro, could read Etruscan. 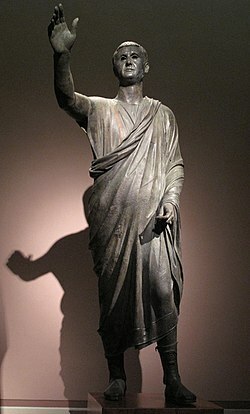 The last person known to have been able to read Etruscan was the Roman emperor Claudius (10 BC – AD 54), who authored a treatise in 20 volumes on the Etruscans, called Tyrrenikà (now lost), and compiled a dictionary (also lost) by interviewing the last few elderly rustics who still spoke the language. Plautia Urgulanilla, the emperor's first wife, was Etruscan. Maximum extent of Etruscan civilization and the twelve Etruscan League cities. Inscriptions have been found in north-west and west-central Italy, in the region that even now bears the name of the Etruscan civilization, Tuscany (from Latin tuscī "Etruscans"), as well as in modern Latium north of Rome, in today's Umbria west of the Tiber, in Campania and in the Po Valley to the north of Etruria. This range may indicate a maximum Italian homeland where the language was at one time spoken. Outside mainland Italy, inscriptions have been found in Corsica, Elba, Gallia Narbonensis, Greece, the Balkans, the Black Sea. But by far, the greatest concentration is in Italy. An inscription found on Lemnos in 1886 is in an alphabet similar to that used to write the Etruscan language and the older Phrygian inscriptions, all derived from Euboean scripts (Western Greek alphabet, alphabets of Asia Minor). Several scholars believe that the Lemnian language could have arrived in the Aegean Sea during the Late Bronze Age, when Mycenaean rulers recruited groups of mercenaries from Sicily, Sardinia and various parts of the Italian peninsula. The phonology of Etruscan is known through the alternation of Greek and Etruscan letters in some inscriptions (for example, the Iguvine Tablets), and many individual words are known through loans into or from Greek and Latin, as well as explanations of Etruscan words by ancient authors. A few concepts of word formation have been formulated (see below). Modern knowledge of the language is incomplete. In 1998, Helmut Rix put forward the view that Etruscan is related to other members of what he called the "Tyrsenian language family". Rix's Tyrsenian family of languages—composed of Rhaetian, anciently spoken in the eastern Alps, and Lemnian, together with Etruscan—has gained acceptance among scholars. Rix's Tyrsenian family has been confirmed by Stefan Schumacher, Norbert Oettinger, Carlo De Simone  and Simona Marchesini. Common features between Etruscan, Rhaetian, and Lemnian have been found in morphology, phonology, and syntax. On the other hand, lexical correspondences are rarely documented, due to the scanty number of Rhaetian and Lemnian texts, and, above all, due to the very ancient date at which these languages split, because the split must have taken place before the Bronze Age. The Tyrsenian family, or Common Tyrrhenic, in this case is often considered to be Paleo-European and to predate the arrival of Indo-European languages in southern Europe. It has been proposed to possibly be part of a wider Paleo-European "Aegean" language family, which would also include Minoan, Eteocretan (possibly descended from Minoan) and Eteocypriot. This has been proposed by G. M. Facchetti, and supported by S. Yatsemirsky, referring to some similarities between Etruscan and Lemnian on one hand, and Minoan and Eteocretan on the other. It has also been proposed that this language family is related to the pre-Indo-European languages of Anatolia, based upon place name analysis. Etruscan was traditionally considered to be a language isolate. In the first century BC, the Greek historian Dionysius of Halicarnassus stated that the Etruscan language was unlike any other. Giuliano Bonfante, a leading scholar in the field, argued in 1990 that "it resembles no other language in Europe or elsewhere". The interest in Etruscan antiquities and the Etruscan language found its modern origin in a book by a Renaissance Dominican friar, Annio da Viterbo, a cabalist and orientalist now remembered mainly for literary forgeries. In 1498, Annio published his antiquarian miscellany titled Antiquitatum variarum (in 17 volumes) where he put together a theory in which both the Hebrew and Etruscan languages were said to originate from a single source, the "Aramaic" spoken by Noah and his descendants, founders of the Etruscan city, Viterbo. Annio also started to excavate Etruscan tombs, unearthing sarcophagi and inscriptions, and made a bold attempt at deciphering the Etruscan language. The 19th century saw numerous attempts to reclassify Etruscan. Ideas of Semitic origins found supporters until this time. In 1858, the last attempt was made by Johann Gustav Stickel, Jena University in his Das Etruskische […] als semitische Sprache erwiesen. A reviewer concluded that Stickel brought forward every possible argument which would speak for that hypothesis, but he proved the opposite of what he had attempted to do. In 1861, Robert Ellis proposed that Etruscan was related to Armenian, which is nowadays acknowledged as an Indo-European language. Exactly 100 years later, a relationship with Albanian was to be advanced by Zecharia Mayani, but Albanian is also known to be an Indo-European language. Several theories from the late 19th and early 20th centuries connected Etruscan to Uralic or even Altaic languages. In 1874, the British scholar Isaac Taylor brought up the idea of a genetic relationship between Etruscan and Hungarian, of which also Jules Martha would approve in his exhaustive study La langue étrusque (1913). In 1911, the French orientalist Baron Carra de Vaux suggested a connection between Etruscan and the Altaic languages. The Hungarian connection was recently revived by Mario Alinei, Emeritus Professor of Italian Languages at the University of Utrecht. 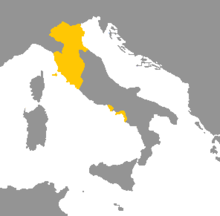 Alinei's proposal has been rejected by Etruscan experts such as Giulio M. Facchetti, Finno-Ugric experts such as Angela Marcantonio, and by Hungarian historical linguists such as Bela Brogyanyi. The idea of a relation between the language of the Minoan Linear A scripts was taken into consideration as the main hypothesis by Michael Ventris before he discovered that, in fact, the language behind the later Linear B script was Mycenean, a Greek dialect. Giulio Mauro Facchetti, a researcher who has dealt with both Etruscan and Minoan, put forward this hypothesis again in 2001, comparing some Minoan words of known meaning with similar Etruscan words. Others have suggested that Tyrsenian languages may yet be distantly related to early Indo-European languages, such as those of the Anatolian branch. More recently, Robert S. P. Beekes argued in 2002 that the people later known as the Lydians and Etruscans had originally lived in northwest Anatolia, with a coastline to the Sea of Marmara, whence they were driven by the Phrygians circa 1200 BC, leaving a remnant known in antiquity as the Tyrsenoi. A segment of this people moved south-west to Lydia, becoming known as the Lydians, while others sailed away to take refuge in Italy, where they became known as Etruscans. This account draws on the well-known story by Herodotus (I, 94) of the Lydian origin of the Etruscans or Tyrrhenians, famously rejected by Dionysius of Halicarnassus (book I), partly on the authority of Xanthus, a Lydian historian, who had no knowledge of the story, and partly on what he judged to be the different languages, laws, and religions of the two peoples. In 2006, Frederik Woudhuizen went further on Herodotus' traces, suggesting that Etruscan belongs to the Anatolian branch of the Indo-European family, specifically to Luwian. Woudhuizen revived a conjecture to the effect that the Tyrsenians came from Anatolia, including Lydia, whence they were driven by the Cimmerians in the early Iron Age, 750–675 BC, leaving some colonists on Lemnos. He makes a number of comparisons of Etruscan to Luwian and asserts that Etruscan is modified Luwian. He accounts for the non-Luwian features as a Mysian influence: "deviations from Luwian [...] may plausibly be ascribed to the dialect of the indigenous population of Mysia." 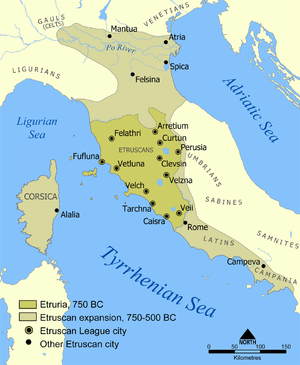 According to Woudhuizen, the Etruscans were initially colonizing the Latins, bringing the alphabet from Anatolia. Another proposal, currently pursued mainly by a few linguists from the former Soviet Union, suggests a relationship with Northeast Caucasian (or Daghestanian) languages. The Latin script owes its existence to the Etruscan alphabet, which was adapted for Latin in the form of the Old Italic script. The Etruscan alphabet employs a Euboean variant of the Greek alphabet using the letter digamma and was in all probability transmitted through Pithecusae and Cumae, two Euboean settlements in southern Italy. This system is ultimately derived from West Semitic scripts. The Etruscans recognized a 26-letter alphabet, which makes an early appearance incised for decoration on a small bucchero terracotta lidded vase in the shape of a cockerel at the Metropolitan Museum of Art, ca 650–600 BC. The full complement of 26 has been termed the model alphabet. The Etruscans did not use four letters of it, mainly because Etruscan did not have the voiced stops b, d and g; and also no o. They innovated one letter for f.
Writing was from right to left except in archaic inscriptions, which occasionally used boustrophedon. An example found at Cerveteri used left to right. In the earliest inscriptions, the words are continuous. From the sixth century BC, they are separated by a dot or a colon, which symbol might also be used to separate syllables. Writing was phonetic; the letters represented the sounds and not conventional spellings. On the other hand, many inscriptions are highly abbreviated and often casually formed, so the identification of individual letters is sometimes difficult. Spelling might vary from city to city, probably reflecting differences of pronunciation. Speech featured a heavy stress on the first syllable of a word, causing syncopation by weakening of the remaining vowels, which then were not represented in writing: Alcsntre for Alexandros, Rasna for Rasena. This speech habit is one explanation of the Etruscan "impossible consonant clusters". The resonants, however, may have been syllabic, accounting for some of the clusters (see below under Consonants). In other cases, the scribe sometimes inserted a vowel: Greek Hēraklēs became Hercle by syncopation and then was expanded to Herecele. Pallottino regarded this variation in vowels as "instability in the quality of vowels" and accounted for the second phase (e.g. Herecele) as "vowel harmony, i.e., of the assimilation of vowels in neighboring syllables ...."
The writing system had two historical phases: the archaic from the seventh to fifth centuries BC, which used the early Greek alphabet, and the later from the fourth to first centuries BC, which modified some of the letters. In the later period, syncopation increased. The alphabet went on in modified form after the language disappeared. In addition to being the source of the Roman alphabet, it has been suggested that it passed northward into Veneto and from there through Raetia into the Germanic lands, where it became the Elder Futhark alphabet, the oldest form of the runes. The Etruscan corpus is edited in the Corpus Inscriptionum Etruscarum (CIE) and Thesaurus Linguae Etruscae (TLE). The Pyrgi Tablets are a bilingual text in Etruscan and Phoenician engraved on three gold leaves, one for the Phoenician and two for the Etruscan. The Etruscan language portion has 16 lines and 37 words. The date is roughly 500 BC. The tablets were found in 1964 by Massimo Pallottino during an excavation at the ancient Etruscan port of Pyrgi, now Santa Severa. The only new Etruscan word that could be extracted from close analysis of the tablets was the word for "three", ci. The Liber Linteus Zagrabiensis, which was later used for mummy wrappings in Egypt. Roughly 1,200 words of readable text, mainly repetitious prayers, yielded about 50 lexical items. The Tabula Capuana (the inscribed tile from Capua) has about 300 readable words in 62 lines, dating to the fifth century BC. The lead foils of Punta della Vipera have about 40 legible words having to do with ritual formulae. It is dated to about 500 BC. 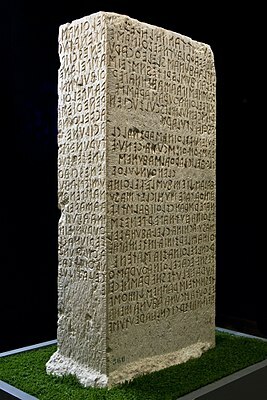 The Cippus Perusinus, a stone slab (cippus) found at Perugia, contains 46 lines and 130 words. The Piacenza Liver, a bronze model of a sheep's liver representing the sky, has the engraved names of the gods ruling different sections. The Tabula Cortonensis, a bronze tablet from Cortona, is believed to record a legal contract, with about 200 words. Discovered in 1992, this new tablet contributed the word for "lake", tisś, but not much else. A stele, from a Sanctuary at Poggio Colla, believed to be connected with the cult of the goddess Uni, with about 70 letters. Only discovered in 2016, it is still in the process of being deciphered. The main material repository of Etruscan civilization, from the modern perspective, is its tombs, all other public and private buildings having been dismantled and the stone reused centuries ago. The tombs are the main source of Etruscan portables, provenance unknown, in collections throughout the world. Their incalculable value has created a brisk black market in Etruscan objets d'art – and equally brisk law enforcement effort, as it is illegal to remove any objects from Etruscan tombs without authorization from the Italian government. Caere or Cerveteri, a UNESCO site. Three complete necropoleis with streets and squares. Many hypogea are concealed beneath tumuli retained by walls; others are cut into cliffs. The Banditaccia necropolis contains more than 1,000 tumuli. Access is through a door. Tarquinia, Tarquinii or Corneto, a UNESCO site: Approximately 6,000 graves dating from the Villanovan (ninth and eighth centuries BC) distributed in necropoleis, the main one being the Monterozzi hypogea of the sixth–fourth centuries BC. About 200 painted tombs display murals of various scenes with call-outs and descriptions in Etruscan. Elaborately carved sarcophagi of marble, alabaster, and nenfro include identificatory and achievemental inscriptions. The Tomb of Orcus at the Scatolini necropolis depicts scenes of the Spurinna family with call-outs. A speculum is a circular or oval hand-mirror used predominantly by Etruscan women. Speculum is Latin; the Etruscan word is malena or malstria. Specula were cast in bronze as one piece or with a tang into which a wooden, bone, or ivory handle fitted. The reflecting surface was created by polishing the flat side. A higher percentage of tin in the mirror improved its ability to reflect. The other side was convex and featured intaglio or cameo scenes from mythology. The piece was generally ornate. About 2,300 specula are known from collections all over the world. As they were popular plunderables, the provenance of only a minority is known. An estimated time window is 530–100 BC. Most probably came from tombs. Many bear inscriptions naming the persons depicted in the scenes, so they are often called picture bilinguals. In 1979, Massimo Pallottino, then president of the Istituto di Studi Etruschi ed Italici initiated the Committee of the Corpus Speculorum Etruscanorum, which resolved to publish all the specula and set editorial standards for doing so. Since then, the committee has grown, acquiring local committees and representatives from most institutions owning Etruscan mirror collections. Each collection is published in its own fascicle by diverse Etruscan scholars. A cista is a bronze container of circular, ovoid, or more rarely rectangular shape used by women for the storage of sundries. They are ornate, often with feet and lids to which figurines may be attached. The internal and external surfaces bear carefully crafted scenes usually from mythology, usually intaglio, or rarely part intaglio, part cameo. Cistae date from the Roman Republic of the fourth and third centuries BC in Etruscan contexts. They may bear various short inscriptions concerning the manufacturer or owner or subject matter. The writing may be Latin, Etruscan, or both. Excavations at Praeneste, an Etruscan city which became Roman, turned up about 118 cistae, one of which has been termed "the Praeneste cista" or "the Ficoroni cista" by art analysts, with special reference to the one manufactured by Novios Plutius and given by Dindia Macolnia to her daughter, as the archaic Latin inscription says. All of them are more accurately termed "the Praenestine cistae". Among the most plunderable portables from the Etruscan tombs of Etruria are the finely engraved gemstones set in patterned gold to form circular or ovoid pieces intended to go on finger rings. Of the magnitude of one centimeter, they are dated to the Etruscan floruit from the second half of the sixth to the first centuries BC. The two main theories of manufacture are native Etruscan and Greek. The materials are mainly dark red carnelian, with agate and sard entering usage from the third to the first centuries BC, along with purely gold finger rings with a hollow engraved bezel setting. The engravings, mainly cameo, but sometimes intaglio, depict scarabs at first and then scenes from Greek mythology, often with heroic personages called out in Etruscan. The gold setting of the bezel bears a border design, such as cabling. Etruscan-minted coins can be dated between 5th and 3rd centuries BC. Use of the 'Chalcidian' standard, based on the silver unit of 5.8 grams, indicates that this custom, like the alphabet, came from Greece. Roman coinage later supplanted Etruscan, but the basic Roman coin, the sesterce, is believed to have been based on the 2.5-denomination Etruscan coin. Etruscan coins have turned up in caches or individually in tombs and in excavations seemingly at random, and concentrated, of course, in Etruria. Etruscan coins were in gold, silver, and bronze, the gold and silver usually having been struck on one side only. The coins often bore a denomination, sometimes a minting authority name, and a cameo motif. Gold denominations were in units of silver; silver, in units of bronze. Full or abbreviated names are mainly Pupluna (Populonia), Vatl or Veltuna (Vetulonia), Velathri (Volaterrae), Velzu or Velznani (Volsinii) and Cha for Chamars (Camars). Insignia are mainly heads of mythological characters or depictions of mythological beasts arranged in a symbolic motif: Apollo, Zeus, Culsans, Athena, Hermes, griffin, gorgon, male sphinx, hippocamp, bull, snake, eagle, or other creatures which had symbolic significance. The Etruscan vowel system consisted of four distinct vowels. Vowels "o" and "u" appear to have not been phonetically distinguished based on the nature of the writing system, as only one symbol is used to cover both in loans from Greek (e.g. Greek κώθων kōthōn > Etruscan qutun "pitcher"). The Etruscan consonant system primarily distinguished between aspirated and non-aspirated stops. There were no voiced stops and loanwords with them were typically devoiced, e.g. Greek thriambos was borrowed by Etruscan, becoming triumpus and triumphus in Latin. Based on standard spellings by Etruscan scribes of words without vowels or with unlikely consonant clusters (e.g. cl 'of this (gen.)' and lautn 'freeman'), it is likely that /m n l r/ were sometimes syllabic sonorants (cf. English "little", "button"). Thus cl /kl̩/ and lautn /ˈlɑwtn̩/. Rix postulates several syllabic consonants, namely /l, r, m, n/ and palatal /lʲ, rʲ, nʲ/ as well as a labiovelar spirant /xʷ/ and some scholars such as Mauro Cristofani also view the aspirates as palatal rather than aspirated but these views are not shared by most Etruscologists. Rix supports his theories by means of variant spellings such as amφare/amφiare, larθal/larθial, aranθ/aranθiia. Etruscan was inflected, varying the endings of nouns, pronouns and verbs. It also had adjectives, adverbs, and conjunctions, which were uninflected. Etruscan substantives had five cases, and a singular and a plural. Not all five cases are attested for every word. Nouns merge the nominative and accusative; pronouns do not generally merge these. Gender appears in personal names (masculine and feminine) and in pronouns (animate and inanimate); otherwise, it is not marked. Unlike the Indo-European languages, Etruscan noun endings were more agglutinative, with some nouns bearing two or three agglutinated suffixes. For example, where Latin would have distinct nominative plural and dative plural endings, Etruscan would suffix the case ending to a plural marker: Latin nominative singular fili-us, "son", plural fili-i, dative plural fili-is, but Etruscan clan, clen-ar and clen-ar-aśi. Moreover, Etruscan nouns could bear multiple suffixes from the case paradigm alone: that is, Etruscan exhibited Suffixaufnahme. Pallottino calls this phenomenon "morphological redetermination", which he defines as "the typical tendency ... to redetermine the syntactical function of the form by the superposition of suffixes." His example is Uni-al-θi, "in the sanctuary of Juno", where -al is a genitive ending and -θi a locative. Steinbauer says of Etruscan, "there can be more than one marker ... to design a case, and ... the same marker can occur for more than one case." No distinction is made between nominative and accusative of nouns. Common nouns use the unmarked root. Names of males may end in -e: Hercle (Hercules), Achle (Achilles), Tite (Titus); of females, in -i, -a, or -u: Uni (Juno), Menrva (Minerva), or Zipu. Names of gods may end in -s: Fufluns, Tins; or they may be the unmarked stem ending in a vowel or consonant: Aplu (Apollo), Paχa (Bacchus), or Turan. Pallottino defines two declensions based on whether the genitive ends in -s/-ś or -l. In the -s group are most noun stems ending in a vowel or a consonant: fler/fler-ś, ramtha/ramtha-ś. In the second are names of females ending in i and names of males that end s, th or n: ati/ati-al, Laris/Laris-al, Arnθ/Arnθ-al. After l or r -us instead of -s appears: Vel/Vel-us. Otherwise, a vowel might be placed before the ending: Arnθ-al instead of Arnθ-l. There is a patronymic ending: -sa or -isa, "son of", but the ordinary genitive might serve that purpose. In the genitive case, morphological redetermination becomes elaborate. Given two male names, Vel and Avle, Vel Avleś means "Vel son of Avle." This expression in the genitive become Vel-uś Avles-la. Pallottino's example of a three-suffix form is Arnθ-al-iśa-la. The dative ending is -si: Tita/Tita-si. The locative ending is -θi: Tarχna/Tarχna-l-θi. In one case, a plural is given for clan, "son", as clenar, "sons". This shows both umlaut and an ending -ar. Plurals for cases other than nominative are made by agglutinating the case ending on clenar. Personal pronouns refer to persons; demonstrative pronouns point out: English this, that, there. The first-person personal pronoun has a nominative mi ("I") and an accusative mini ("me"). The third person has a personal form an ("he" or "she") and an inanimate in ("it"). The second person is uncertain, but some, like the Bonfantes, have claimed a dative singular une ("to thee") and an accusative singular un ("thee"). The demonstratives, ca and ta, are used without distinction. The nominative–accusative singular forms are: ica, eca, ca, ita, ta; the plural: cei, tei. There is a genitive singular: cla, tla, cal and plural clal. The accusative singular: can, cen, cn, ecn, etan, tn; plural cnl. Locative singular: calti, ceiθi, clθ(i), eclθi; plural caiti, ceiθi. quality, -u, -iu or -c: ais/ais-iu, "god/divine"; zamaθi/zamθi-c, "gold/golden"
collective, -cva, -chva, -cve, -χve, -ia: sren/sren-cva: "figure/figured"; etera/etera-ia, "slave/servile"
Adverbs are unmarked: etnam, "again"; θui, "now"; θuni, "at first." Most Indo-European adverbs are formed from the oblique cases, which become unproductive and descend to fixed forms. Cases such as the ablative are therefore called "adverbial". If there is any such system in Etruscan, it is not obvious from the relatively few surviving adverbs. Etruscan used a verbal root with a zero suffix or -a without distinction to number or person: ar, ar-a, "he, she, we, you, they make". Adding the suffix -(a)ce to the verb root produces a third-person singular active, which has been called variously a "past", a "preterite", a "perfect" or an "aorist". In contrast to Indo-European, this form is not marked for person. Examples: tur/tur-ce, "gives/gave"; sval/sval-ce, "lives/lived." The third-person past passive is formed with -che: mena/mena-ce/mena-che, "offers/offered/was offered". Some words with corresponding Latin or other Indo-European forms are likely loanwords to or from Etruscan. For example, neftś "nephew", is probably from Latin (Latin nepōs, nepōtis; this is a cognate of German Neffe, Old Norse nefi). A number of words and names for which Etruscan origin has been proposed survive in Latin. At least one Etruscan word has an apparent Semitic origin: talitha "girl" (Aramaic; could have been transmitted by Phoenicians). The word pera "house" is a false cognate to the Coptic per "house". from arēna "arena" < harēna, "arena, sand" < archaic hasēna < Sabine fasēna, unknown Etruscan word as the basis for fas- with Etruscan ending -ēna. from balteus, "sword belt"; the sole connection between this word and Etruscan is a statement by Marcus Terentius Varro that it was of Etruscan origin. All else is speculation. from Latin mercātus, of obscure origin, perhaps Etruscan. from Latin milēs "soldier"; either from Etruscan or related to Greek homilos, "assembled crowd" (compare homily). from Middle English persone, from Old French persone, from Latin persona, "mask", probably from Etruscan phersu, "mask". from Latin satelles, meaning "bodyguard, attendant", perhaps from Etruscan satnal. Much debate has been carried out about a possible Indo-European origin of the Etruscan cardinals. In the words of Larissa Bonfante (1990), "What these numerals show, beyond any shadow of a doubt, is the non-Indo-European nature of the Etruscan language". Conversely, other scholars, including Francisco R. Adrados, Albert Carnoy, Marcello Durante, Vladimir Georgiev, Alessando Morandi and Massimo Pittau, have proposed a close phonetic proximity of the first ten Etruscan numerals to the corresponding numerals in other Indo-European languages. Italian linguist and glottologist Massimo Pittau has argued that "all the first ten Etruscan numerals have a congruent phonetic matching in as many Indo-European languages" and "perfectly fit within the Indo-European series", supporting the idea that the Etruscan language was of Indo-European origins. although it is unclear which of śa and huθ meant "four" and "six" respectively. aska Greek ἄσκος áskos "wineskin"
θina, tina derived from θi "water"
Liber Linteus – An Etruscan linen book that ended as mummy wraps in Egypt. Pyrgi Tablets – Bilingual Etruscan-Phoenician golden leaves. ^ Hammarström, Harald; Forkel, Robert; Haspelmath, Martin, eds. (2017). "Etruscan". Glottolog 3.0. Jena, Germany: Max Planck Institute for the Science of Human History. ^ Bauer, Laurie (2007). The Linguistics Student's Handbook. Edinburgh. ^ a b Bonfante (1990), p. 12. ^ A summary of the locations of the inscriptions published in the EDP project, given below under External links, is stated in its Guide. ^ de Ligt, Luuk (2008–2009). "An 'Eteocretan' inscription from Prasos and the homeland of the Sea Peoples" (PDF). Talanta. XL-XLI: 151–172. Retrieved 13 June 2016. ^ Rix, Helmut (1998). Rätisch und Etruskisch. Institut für Sprachwissenschaft der Universität Innsbruck: Innsbruck. ^ Baldi, Philip Baldi (2002). The Foundations of Latin. Walter de Gruyter. pp. 111–112. ISBN 978-3-11-080711-0. ^ Comrie, Bernard (15 April 2008). Mark Aronoff, Janie Rees-Miller (ed.). Languages of the world, in "The handbook of linguistics". Oxford: Blackwell/Wiley. p. 25. ^ Beekes, Robert S. P. (2003). The Origin of the Etruscans. Koninklijke Nederlandse Akademie van Wetenschappen: Amsterdam. ^ Van der Meer, L. Bouke (2004). Etruscan origins: Language and Archaeology, in: Bulletin antieke beschaving, vol. 79. ^ Woodard, Roger D. (2008). The Ancient Languages of Europe. Cambridge University Press. p. 142. ISBN 978-1-139-46932-6. ^ Simona Marchesini (translation by Melanie Rockenhaus) (2013). "Raetic (languages)". 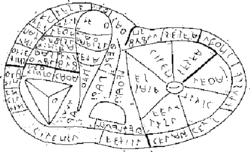 Mnamon - Ancient Writing Systems in the Mediterranean. Scuola Normale Superiore. Retrieved 26 July 2018. ^ Facchetti 2002, p. 136. ^ Stickel, Johann Gustav (1858). Das Etruskische durch Erklärung von Inschriften und Namen als semitische Sprache erwiesen. Leipzig: Wilhelm Engelmann. ^ Gildemeister, Johannes. In: ZDMG 13 (1859), pp. 289–304. ^ Ellis, Robert (1861). The Armenian origin of the Etruscans. London: Parker, Son, & Bourn. ^ Mayani, Zacharie (1961). The Etruscans Begin to Speak. Translation by Patrick Evans. London: Souvenir Press. ^ a b Alfréd Tóth. "Etruscans, Huns and Hungarians". Archived from the original on March 2, 2010. Retrieved June 17, 2010. ^ Alinei, Mario (2003). Etrusco: una forma arcaica di ungherese. Il Mulino: Bologna. ^ Facchetti, Giulio M. "The Interpretation of Etruscan Texts and its Limits" (PDF)[permanent dead link]. In: Journal of Indo-European Studies 33, 3/4, 2005, 359–388. Quote from p. 371: ‘[…] suffice it to say that Alinei clears away all the combinatory work done on Etruscan (for grammar specially) to try to make Uralic inflections fit without ripping the seams. He completely ignores the aforesaid recent findings in phonology (and phoneme/grapheme relationships), returning to the obsolete but convenient theory that the handwriting changed and orthography was not consolidated'. ^ Marcantonio, Angela (2004). "Un caso di 'fantalinguistica'. A proposito di Mario Alinei: 'Etrusco: una forma arcaica di ungherese'." In: Studi e Saggi Linguistici XLII, 173–200, where Marcantonio states that "La tesi dell’Alinei è da rigettare senza alcuna riserva" ("Alinei's thesis must be rejected without any reservation"), criticizes his methodology and the fact that he ignored the comparison with Latin and Greek words in pnomastic and institutional vocabulary. Large quotes can be read at Melinda Tamás-Tarr "Sulla scrittura degli Etruschi: «Ma è veramente una scrittura etrusca»? Cosa sappiamo degli Etruschi III". In: Osservatorio letterario. Ferrara e l’Altrove X/XI, Nos. 53/54 (November–December/January–February 2006/2007, 67–73. Marcantonio is Associated Professor of Historical Linguistics and Finno-Ugric Studies at the University of Rome "La Sapienza" (personal website). ^ Brogyanyi, Bela. "Die ungarische alternative Sprachforschung und ihr ideologischer Hintergrund – Versuch einer Diagnose". In: Sprache & Sprachen 38 (2008), 3–15, who claims that Alinei shows a complete ignorance on Etruscan and Hungarian ["glänzt er aber durch völlige Unkenntnis des Ungarischen und Etruskischen (vgl. Alinei 2003)"] and that the thesis of a relation between Hungarian and Etruscan languages deserves no attention. ^ Facchetti, Giulio M. (2001). "Qualche osservazione sulla lingua minoica". In: Kadmos 40/1, 1–38. ^ For example, Steinbauer (1999). ^ Beekes, Robert S. P."The Origin of the Etruscans" Archived 2012-01-17 at the Wayback Machine. In: Biblioteca Orientalis 59 (2002), 206–242. ^ Woudhuizen, Frederik Christiaan (2006). The Ethnicity of the Sea Peoples (PDF). Rotterdam: Erasmus Universiteit. p. 139. ^ Robertson, Ed (2006). "Etruscan's genealogical linguistic relationship with Nakh–Daghestanian: a preliminary evaluation" (PDF). Archived from the original (PDF) on 10 August 2011. Retrieved 2009-07-13. ^ Starostin, Sergei; Orel, Vladimir (1989). "Etruscan and North Caucasian". In Shevoroshkin, Vitaliy (ed.). Explorations in Language Macrofamilies. Bochum Publications in Evolutionary Cultural Semiotics. Bochum. ^ The alphabet can also be found with alternative forms of the letters at Omniglot. ^ a b c Bonfante (1990) chapter 2. ^ "Bucchero". Khan Academy. Retrieved 15 March 2018. ^ Bonfantes (2002) page 55. ^ The Bonfantes (2002) page 56. ^ The Bonfantes (2002), page 117 following. ^ Massimo Pallottino, Maristella Pandolfini Angeletti, Thesaurus linguae Etruscae, Volume 1 (1978); review by A. J. Pfiffig in Gnomon 52.6 (1980), 561–563. Supplements in 1984, 1991 and 1998. A 2nd revised edition by Enrico Benelli appeared in 2009; review by G. van Heems, Bryn Mawr Classical Review 2010.01.05. ^ a b The Bonfantes (2002) page 58. ^ Robinson, Andrew (2002). Lost languages : the enigma of the world's undeciphered scripts. New York: McGraw-Hill. p. 170. ISBN 0071357432. ^ Brief description and picture at The principle discoveries with Etruscan inscriptions Archived 2007-07-03 at the Wayback Machine, article published by the Borough of Santa Marinella and the Archaeological Department of Southern Etruria of the Italian government. ^ Robinson, Andrew (2002). Lost languages : the enigma of the world's undeciphered scripts. New York: McGraw-Hill. p. 181. ISBN 0071357432. ^ "One of the most significant Etruscan discoveries in decades names female goddess Uni - SMU Research". blog.smu.edu. Retrieved 15 March 2018. Scientific Tomb-Robbing, article in Time, Monday, Feb. 25, 1957, displayed at time.com. Hot from the Tomb: The Antiquities Racket, article in Time, Monday, Mar. 26, 1973, displayed at time.com. ^ a b Refer to Etruscan Necropoleis of Cerveteri and Tarquinia, a World Heritage site. ^ Some popular Internet sites giving photographs and details of the necropolis are: Cisra (Roman Caere / Modern Cerveteri) at mysteriousetruscans.com. Chapter XXXIII CERVETRI.a – AGYLLA or CAERE., George Dennis at Bill Thayer's Website. Aerial photo and map Archived 2007-09-29 at the Wayback Machine at mapsack.com. ^ A history of the tombs at Tarquinia and links to descriptions of the most famous ones is given at  on mysteriousetruscans.com. ^ For pictures and a description refer to the Etruscan Mirrors article at mysteriousetruscans.com. ^ For the dates, more pictures and descriptions, see the Hand Mirror with the Judgment of Paris article published online by the Allen Memorial Art Museum of Oberlin College. ^ Paggi, Maddalena. "The Praenestine Cistae" (October 2004), New York: The Metropolitan Museum of Art, in Timeline of Art History. Murray, Alexander Stuart; Smith, Arthur Hamilton (1911). "Gem § Etruscan Gems" . In Chisholm, Hugh (ed.). Encyclopædia Britannica. 11 (11th ed.). Cambridge University Press. p. 566. ^ Ancient Coins of Etruria. ^ J.H. Adams pages 163–164. ^ a b Bonfante (1990), page 20. ^ Bonfante (1990) page 19. ^ Etruscan Grammar: Summary at Steinbauer's website. ^ Pallottino page 114, Bonfante (1990) page 41. ^ The summary in this section is taken from the tables of the Bonfantes (2002) pages 91–94, which go into considerably more detail, citing examples. ^ The words in this table come from the Glossaries of Bonfante (1990) and Pallottino. The latter also gives a grouping by topic on pages 275 following, the last chapter of the book. ^ Breyer (1993) p. 259. ^ Donaldson, John William (1852). Varronianus: A Critical and Historical Introduction to the Ethnography of Ancient Italy and to the Philological Study of the Latin Language (2 ed.). London, Cambridge: J. W. Parker & Son. p. 154. Breyer (1993) pp 428–429 reports on an attempt to bring in Hittite and Gothic connecting it with a totally speculative root *-lst-. ^ "market - Origin and meaning of market by Online Etymology Dictionary". www.etymonline.com. Retrieved 15 March 2018. ^ "military - Origin and meaning of military by Online Etymology Dictionary". www.etymonline.com. Retrieved 15 March 2018. ^ "satellite - Origin and meaning of satellite by Online Etymology Dictionary". www.etymonline.com. Retrieved 15 March 2018. ^ Bonfante, L.,Etruscan, University of California Press (Berkeley and Los Angeles, 1990), page 22. ^ Morandi, A., Nuovi lineamenti di lingua etrusca, Erre Emme (Roma, 1991), chapter IV. Adams, J. N. (2003). Bilingualism and the Latin Language. Cambridge University Press. ISBN 0-521-81771-4. Available for preview on Google Books. Agostiniani, Luciano (2013). "The Etruscan Language." The Etruscan World, ed. Jean MacIntosh Turfa, 457-77. Abingdon: Routledge. Bonfante, Giuliano; Bonfante, Larissa (2002). The Etruscan Language: an Introduction. Manchester: University of Manchester Press. ISBN 0-7190-5540-7. Preview available on Google Books. Bonfante, Larissa (1990). Etruscan. Berkeley and Los Angeles: University of California Press. ISBN 0-520-07118-2. Preview available at Google Books. Cristofani, Mauro; et al. (1984). Gli Etruschi: una nuova immagine. Firenze, Giunti Martello. Cristofani, Mauro (1979). The Etruscans: A New Investigation (Echoes of the ancient world). Orbis Pub. ISBN 0-85613-259-4. Facchetti, Giulio M. (2000). L'enigma svelato della lingua etrusca. Roma: Newton & Compton. ISBN 978-88-8289-458-0. Facchetti, Giulio M. (2002). Appunti di morfologia etrusca. Con un'appendice sulle questioni delle affinità genetiche dell'etrusco. Roma: Olshcki. ISBN 978-88-222-5138-1. Maras, Daniele (2013). "Numbers and reckoning: A whole civilization founded upon divisions." The Etruscan World, ed. Jean MacIntosh Turfa, 478-91. Abingdon: Routledge. Pallottino, Massimo (1955). The Etruscans. Penguin Books. Translated from the Italian by J. Cremona. Rix, Helmut (1991). Etruskische Texte. G. Narr. ISBN 3-8233-4240-1. 2 vols. Steinbauer, Dieter H. (1999). Neues Handbuch des Etruskischen. Scripta Mercaturae. ISBN 3-89590-080-X. Wallace, Rex E. (2008). Zikh Rasna: A Manual of the Etruscan Language and Inscriptions. Beech Stave Press. ISBN 978-0-9747927-4-3. Viteliu: The Languages of Ancient Italy at the Wayback Machine (archived December 7, 2002). TM Texts Etruscan A list of all texts in Trismegistos. An Etruscan Vocabulary at the Wayback Machine (archived December 13, 2002). A short, one-page glossary with numerals as well. "Etruscan–English Dictionary". Archived from the original on September 27, 2007. Retrieved May 1, 2007. CS1 maint: Unfit url (link) . An extensive lexicon compiled from other lexicon sites. Links to the major Etruscan glossaries on the Internet are included. Paleoglot: Online Etruscan-English dictionary; summary of Etruscan grammar. A searchable Etruscan-to-English dictionary applet and a summary of Etruscan grammar. A Tentative Etymological Glossary of Etruscan by Arnaud Fournet.